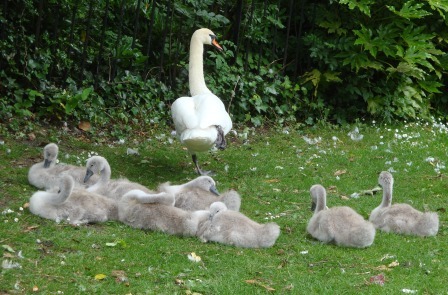 Another installment of cygnet watch 2013. Less than a month ago there were four cygnets in the Blanchardstown pond, but sadly there’s only three now. 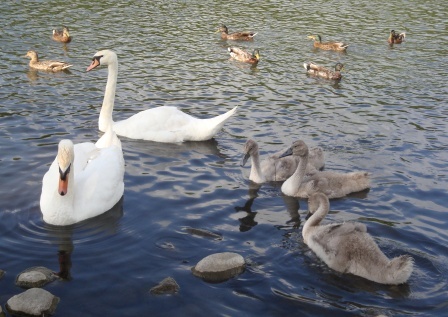 It seems to be the natural order that the swan families lose at least one child. The Dublin 9 had been reduced to 8 and as of a week ago, were holding steady. Do the parents mourn and shed swan tears over their lost ones? 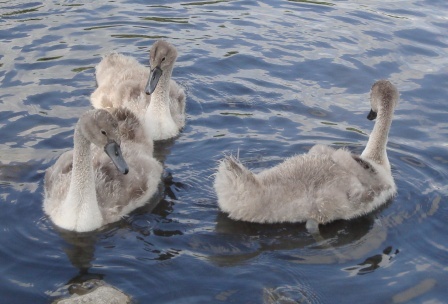 Blanchardstown Swan Family – look closely at the nearest cygnet to see how small their wings are. They grow very gradually. The birds in Dublin have long been domesticated, taking food from the hand of the bird man of St. Stephen’s Green. Now that the Blanchardstown cygnets are a little bigger, they too come swimming over when humans approach, expecting their bits of bread. At first the swan family was out in the middle of the pond as I threw a few bits to the waiting hens and mallards. It wasn’t long before one of the swans came over with the rest of the family close behind for a sampling of the treats on offer. The female chased the ducks away and they scattered quickly at her nipping, making room for the cygnets to scramble for the bits I threw. Out of bread, I just watched for a while. The mother swan stayed near shore but the rest began to drift away with one cygnet going back to the middle of the pond. A mother and child appeared with more bread and again the mother swan chased after the ducks to allow her children to feast. The one in the middle of the pond was tail in the air searching for underwater snacks and nearly realized too late that its siblings were being offered additional morsels and made a last minute dash. Off by itself most of the time, but straying in when bread was on offer was a lonely coot. 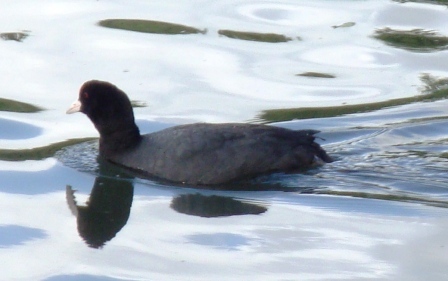 From what I’ve read about coots, they believe in survival of the fittest and it doesn’t appear they would shed a tear over a lost child. I would still mourn the loss, though; just as I do the cygnets who have been returned to the wheel of life.